Who are you going to believe… Dear Leader or your lying eyes? Barack Obama in his Weekly Address today insisted that the $787 billion record Stimulus boondoggle is working. This is after he earlier promised that unemployment would not go above 8% if the bill passed. It’s currently at 9.5%. President Obama on Saturday defended his $787 billion economic stimulus package as having ended an economic free fall after a week of criticism from both ends of the political spectrum. Obama used his weekly address to the nation Saturday to say the stimulus in a little more than 100 days had worked as intended, and that without it there would have been tens of thousands of additional layoffs. He added that the stimulus was not designed to work in four months but over two years, and seemed to ask those listening or viewing the address for patience. “Crucially, this is a plan that will also accelerate greatly throughout the summer and the fall,” said Obama, who added his administration always knew it would take some time for money to get out the door. According to recovery.gov, the government web site tracking the stimulus, only $523 million of the $20 billion allocated to the Department of Transportation has been spent so far. It’s hard to figure out where he’s getting his information. 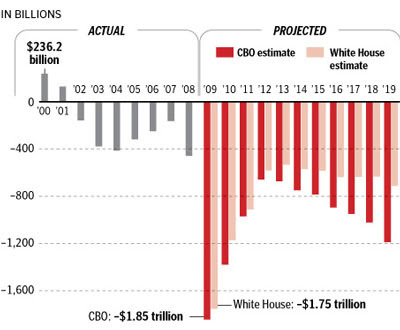 Obama will quadruple the US budget deficit his first year in office. And, he wants to spend trillions more for his Obamacare program. 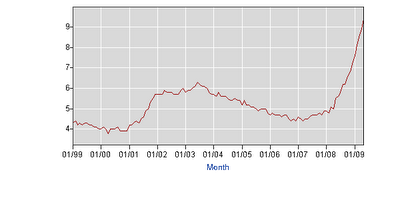 The US unemployment rate rose from 7.6% to 9.5% under Obama… the highest rate in 26 years. Obama said with the Stimulus Bill the unemployment rate would not go over 8%. The unemployment rate is currently at 9.5%. But, Obama says it’s working. The US has lost 16,000 jobs each day since Democrats passed their non-Stimulus bill, the largest redistribution of wealth from the private sector to government officials in US history. This is after Obama promised the Stimulus bill would bring down unemployment. More… Stocks are down for the 4th straight week. More… Dinocrat has more on Obama’s latest whopper from his address today.